1900: As the twentieth century dawns, scientists have few hard facts about the origins of Earth, humans, or life itself. Most believe the Earth was formed from material torn from the sun, and that as it cooled, its surface contracted, buckled, and cracked, creating mountains and oceans and causing earthquakes and volcanoes. We know little about our prehistoric ancestors. Our best clues are in the few ancient fossils recovered in Europe and Asia. The mechanism of evolution, by which physical traits are passed from one generation to the next, is unknown. Here are a few steps on the science odyssey from then to now, including links to activities and databank entries on this site. In 1907, scientists find a way to use radioactive decay to determine the age of the Earth, establishing that it is much older than many believed. 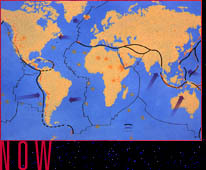 In 1912, a new theory is set forth, proposing that continents have moved over the ages and were once joined together in one supercontinent. The theory is largely ignored until later in the century. In 1913, Arthur Holmes proposes a geologic time scale that pushes the age of the Earth back to 4 billion years. In 1947, further refinements in radiometric dating allow scienctists to pinpoint the age of more recent events. New evidence supporting continental drift is found by mapping the sea floor. Beginning in 1959, several important fossil finds in Africa add to our understanding of human evolution. By 1962, the mechanisms that power the movement of continents have been proposed. The following year, further evidence is found to support the theory of sea-floor spreading. During the late 1960s and 1970s, physicist Steven Hawking develops new theories about the origins of the universe, helping to develop theories that explain all forms of matter. In 1974, fossils of the earliest hominid to walk upright on two feet are found. In 1977, scientists studying the Great Global Rift find life forms that may have resembled the first life on Earth. In 1980, evidence for a cosmic catastrophe is used to explain mass extinctions in our Earth's past. In 1994, fossilized remains of the oldest human ancestor to date are found -- perhaps the common link between us and the chimpanzees. In 1996, a meteorite of Martian origin found twelve years earlier in Antarctica raises the possibility of life of other planets. Today: Our planet is not a static platform for life. The Earth is dynamic and unpredictable. Its surface is composed of large moving plates that consist of both the continents and oceanic crust. The movement is only a few centimeters a year, but it's enough to reshape the Earth, build mountains, spawn earthquakes, and create volcanoes. The accumulation of fossil finds has shown that the birthplace of the human species is in Africa. With the discovery of the structure of DNA has come an understanding of the mechanism by which chemical molecules pass on the code of heredity, creating the basis for evolution and the diversity of life.